This is a black metal centre frame for all iPhone models including the black and white versions of the iPhone 4. If your centre frame is scratched or damaged, why not replace it with a brand new sleek titanium nitride black frame.The metal edging has been anodized with a sleek black finish before being thermally sealed, this is the same process Apple use on the coloured iPad Mini. This center frame has not been painted! If your original centre frame is scratched, scuffed or damaged, why not replace it with a brand new stylish jet black titanium nitride centre frame. 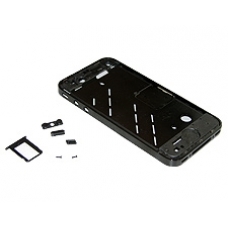 * Includes Black Volume Button, Black Silent Button, Black Power Button, Black Sim Tray & 2 x Black Bottom Screws. * Exclusive and Hand Finished. * Thick Heavy Titanium Nitrade Plate. * Lacquer Coated for Additional Hard Wearing Protection.